This was about as comprehensive as 2-0 victories get. The only disappointment for Jason Wilcox and his u18s was that City’s forwards couldn’t add a considerably more pleasing gloss to the final scoreline. In truth the game was settled early on. The red card, correctly awarded for what its worth, left City in complete control and killed the game as a contest. Those looking for a narrative, and there was national media in attendance, were probably left disappointed that greater damage wasn’t inflicted on the ten men of United. Credit where its due, the United defence made it difficult for City but the scoreline should have been considerably more comfortable than it ended up. As it often is, it was left to Nmecha to break the deadlock. After a relatively cagey opening twenty minutes the game suddenly burst into life; Nmecha capitalised on some sloppy United play and burst into the area. He was hacked down, the ref pointed to the spot and duly dished out a red card to the culprit. Nmecha himself did the rest from the spot, slotting into the bottom right hand corner with the keeper going the other way. After that, it was all City. Buckley missed a sitter, somehow firing over from six yards after great work down the right from Duhaney, and Erik Sarmiento exchanged a beautiful one-two with Nmecha before being caught just as he was about to pull the trigger. Nmecha should have had another penalty too, dragged back as he burst into the area. You suspect it would’ve been given if there hadn’t already been one awarded, but it was nervously ignored. The second half didn’t see any notable change in proceedings. City passed it around, United remained resolute and the game went through extended periods of attack versus defence. City’s numerical superiority told and United barely crossed into City’s half. Before the second there was a great chance for Ash Kigbu, heading a Brahim corner just wide, and Lukas Nmecha almost scored a screamer. He delightfully span one, bulldozed past another, and drove into the area before uncharacteristically losing his composure when it most mattered. He fired wildly over from about 14 yards, disappointingly. It would’ve been some goal, but it mattered not in the end as any lingering doubts were quickly vanquished after Brahim grabbed the second. Sarmiento made it, harrying exceptionally on the left to win the ball high up the pitch. He laid it back to Brahim who coolly feinted past one before lifting into the roof of the net with around twenty minutes left to play. There were other chances, Fernandes notably drilling wide after an opportunity of his own making, but it remained two nil. It was a deserved victory, if perhaps a little underwhelming. Wilcox talked after the game about his dissatisfaction that City didn’t do more, and he was right. A City team at their best would’ve moved the ball quicker, would have been vastly more clinical, and in general put a vulnerable and rudderless United team to the sword. There was a clear gulf between the two, but it wasn’t hammered home. In a weird way, and as it often happens when a team goes up against just ten men, there might have been more space for City if the numbers on the pitch had remained level. United shut up shop to prevent a landslide, and it worked as it only ended up as a relatively respectable, yet forgettable 2-0 victory. 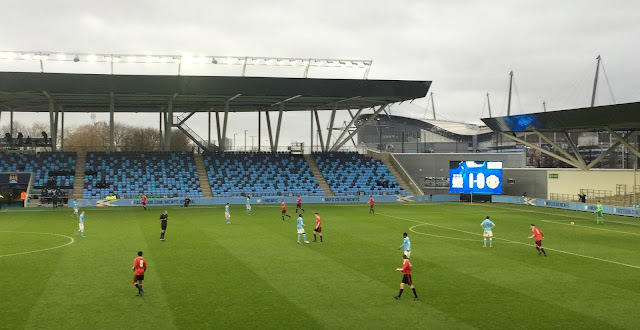 Of course, the job was done, but perhaps not the message City’s u18s would’ve liked to send, especially with Khaldoon sat watching in the stands. Individually, Sarmiento stood out. The young Spanish left-back has made a fine start to life at the CFA, and he impressed once again. He’s clearly exceptional technically, but it was a showing of true determination and grit that left him with the plaudits. There was a real tenacity to his display and it was hugely encouraging to see. Davenport was a fiery, battling presence in the heart of midfield as he always is, and Kongolo, though not quite as explosive going forward as he has been in the last couple of weeks, was an assured, competent partner alongside him. After a great run of form, Dilrosun didn’t have his most effective outing in a blue shirt. His struggled a little to find space as United sat back, likewise Buckley on the right. Neither were bad, but neither reached their usual high standards. Brahim was quiet in the first half, often crowded out as he started at the peak of the midfield three. He was switched out wide left after Dilrosun was replaced and he found considerably greater joy. He frequently beat the right-back and his goal was lovely. He showed a touch of real class to let the ball run across him to give himself the half of yard he needed, before finishing coolly. Nmecha was good. He’s a real prospect and he’s becoming quite a physical specimen now too. He held the ball up well, intelligently linked play with those around him and he got his usual goal too. He’s a very interesting prospect, a complete striker really. Other than consistency and experience, he has no real weaknesses to his game and he’ll surely feature heavily for the EDS next season. There was little to do defensively, with United only really mustering one half shot from the edge of the area throughout the entire game. Humphreys and Oliver strolled the first half before the former was replaced by Ash Kigbu at the interval. It was good to see the young defender back after a spell out injured, and there was one reminder of his power as he drove powerfully past two United challenges towards goal. 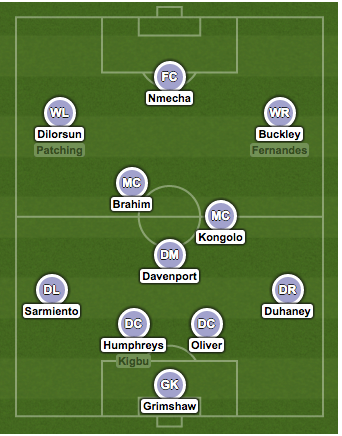 Duhaney at right-back had a solid game, supporting Buckley where he could. He had little space to work with, yet he showcased some superbly intricate footwork, driving into the area past United’s left-back. Fernandes grabbed ten minutes ahead of him on the right as a late sub for Isaac Buckley, and he looked as tricky and as graceful as ever. With his first touch he proceeded to turn his opponent inside out three times, yet he could only drag his shot into the side-netting. Patching had a thirty minute runout too, elegantly keeping things ticking over, though like others he found United’s packed back-line a little hard to breach. Grimshaw was literally a spectator. He had absolutely nothing to do other than keep warm on a surprisingly blustery day. He watched as City kept the ball and the referee blew for full-time. The result confirmed City’s place in top four ahead of the league splits in a few weeks time. It left City a remarkable 33 points ahead of United as they extended their lead at the top of the table. The merging of the top four teams from the southern division with those from this league should be fascinating. Chelsea are incredibly strong and they’ll provide a stern challenge, likewise Fulham and Reading. Long before that though, these two teams meet again in the return game at the Carrington training complex. It’ll be a relatively non-event for both teams, with nothing other than local pride at show, but it’ll be keenly fought. You suspect there will be space for City to counter as the away team, and it’ll be another intriguing contest. There will be a report here at City Watch, as ever, after the game. Not the finest of games, to be truthful. City never really got going on a horribly miserable night in East Manchester. It was cold, dreary and wet, as it always seemingly is at the CFA, and the game went through the motions for the vast majority of the night. City didn’t deserve a defeat, but at the same time, it perhaps wasn’t really a game that either team deserved to win in what was a rather forgettable encounter. It was an interesting lineup though – Angelino returned, pulling on a blue shirt for the first team since his loan move from New York City. Likewise, Brandon Barker also made his first appearance after his spell at Rotherham came to an unceremoniously abrupt end. They reunited their strong partnership down the left, while over at right-back James Horsfield stepped in for Pablo Maffeo as he finalised the details of his loan move to FC Girona. Ash Smith-Brown stepped in at centre-back alongside Ellis Plummer in the absence of Adarabioyo and Humphreys, and ahead of those two sat Aleix Garcia as he anchored the midfield alongside George Glendon and Bersant Celina. Jorge Intima started on the right-wing and David Faupala stepped in upfront with Ambrose injured and Nmecha away ahead of the FA Youth Cup tie. There wasn’t much of note in the first half. City dictated play, controlling the ball for most of the 45 minutes, but they couldn’t really break down an Everton defence that was all too happy to sit back and absorb the pressure. Celina did have a half chance, firing into the keeper’s hands after a scuffed Intima shot had fallen to him. Intima himself could have also scored, hitting the sidenetting after some nice linkup play between Horsfield and Faupala. Everton had their own golden chance too, but City were thankful to Angus Gunn who smartly kept out the visitors after a goal-mouth scramble, which kept the scores level at the break. Parity didn’t last long though, and the game’s solitary goal came immediately after the restart. Everton scored what was to be the eventual winner after thirty seconds, and it wasn’t pretty. A ball broke loose after a cross from the left, and a scuffed half-volley trickled in at the near post. It was disappointing, and despite City’s best efforts they couldn’t level proceedings. City did up the tempo, and Bersant Celina came the closest. He was left scratching his head after he somehow managed to strike the post from barely 5 yards. Isaac Buckley had done all the handwork, his pace had expertly taken him to the byeline and his pull-back deserved better. There was a few other promising moments, Barker in particular caused a bit of trouble down the left, but his lack of recent match practice meant his radar wasn’t quite as fine-tuned as normal and his final ball was lacking. It wasn’t to be and the game finished 1-0 to Everton. It wasn’t a vintage performance, but it was understandable given the rather thrown together nature of the team. There was some positives. Barker, though initially rusty, and he did a pretty torrid first half, grew into the game and he looked like something approaching his usual brilliant best as he created three or four opportunities good moments with some powerful bursts forward. Angelino, too, looked a sprightly presence, clearly refreshed after a few weeks rest following his loan. He looked confident, and there was some of his trademark attacking forays as he tried to get City going. Aleix Garcia only lasted the first forty-five, but he was an assured, firm presence in the centre of midfield. He’s adapting to English football well and he’s clearly getting to grips with the more physical nature of the game. He’s clearly an exceptional footballer technically, and if he can add an almost Gareth Barry-esque cleverness to his game then he’ll be some prospect. Jorge Intima had a mixed game – the Portugese winger offered plenty of energy down the right, and his work rate was admirable, as it always is, but he also guilty of wasting a good chance. His delivery let him down when it mattered too. It didn’t really happen for Faupala. He ran the line well up top, but there was little for him to go off or run onto as City struggled to find space between the lines. Celina, clearly on a high from the weekend, looked lively, though it didn’t quite come off the technically gifted midfielder. There was a lack of any real intelligent movement around him on a night not really built for one touch intricacy. He should’ve scored though, and 9 out of 10 times he probably would have. Glendon looked infinitely more comfortable when he was moved back to the holding mid position at half-time. He wasn’t bad as such in a more advanced position, but he perhaps isn’t the most natural of attackers and he reads the game well from a deeper position. Sinan Bytyqi sat just ahead of Glendon after he came on for Aleix Garcia at half-time, and it was something of a surprise to see him in the heart of midfield. He’s usually lined up out wide, or just off the striker, but he was a little deeper here as he looked to influence the game from the centre. He’s got the physique for it now at least. That spell on the sidelines has clearly seen him spend some time in the gym. He’s bigger, clearly. It wasn’t a notable runout, but he’s far from match fit so patience is needed, but his potential reinvention could be fascinating to witness. Horsfield had a good, solid game at right-back. He wasn’t tested much defensively, but there was a nice burst forward in the first half that lead to a chance that Intima squandered. Smith-Brown in the middle had a relatively solid game, likewise Plummer, but in truth they had little to do. A couple of stray passes aside, both were content to receive the ball from Gunn in a low-key night. Fernandes looked positive in his brief runout, dropping his shoulder with the same purposeful elegance he always does in the u18s, and Buckley, the u18s leading scorer this year, underlined his growing promise with a sprightly runout. He should’ve created the equaliser, but Celina squandered his good work as mentioned earlier. It was a night to forget in the end though for Simon Davies’ EDS team, but with all eyes firmly on the FA Youth Cup trip to Leeds on Thursday night, it was hard to expect too much else. That game at least should bring a few goals. Fingers crossed. 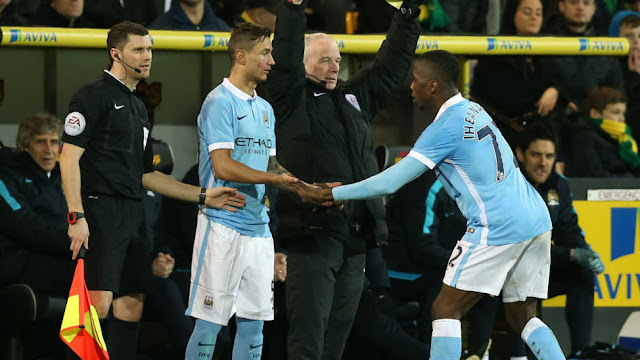 Bersant Celina made his first-team debut today as City strolled to a 3-0 victory at Norwich in the FA Cup, and though it was only for just under ten minutes, it was deserved. I'd be waiting for this moment for some months now, and it was a great relief that the nineteen-year-old finally made his domestic appearance. The young attacking midfielder is a wonderfully graceful little footballer, the kind that would fit into the first team's pass and move style with ease. Elegant, skilful, always with an eye for the spectacular – he’s been a regular for the EDS this season and was a huge part of last season’s run to the FA Youth Cup final. He’s capable of playing in a whole host of positions across the attacking third. Nominally at the peak of a midfield three, he’s also played as a false 9 for the recently formed Kosovo national side, and he’s also lined up out wide for the EDS, acquitting himself well in all roles. This debut was long overdue. Though far from the finished article, and most young attackers never are at 19, there is clearly a huge amount of ability within those boots of his, with vast potential for greater things. If he learns to assert himself in a more physical environment, and also learns how to contribute when the team is in something of a fallow spell, then he’ll go far. There are no doubts technically. He’s at his best when the team is confident around him, dropping into space and playing excellent little one-twos in and around the area. The kind of player who would appreciate the talents of Silva and co. He’s a magnificent free-kick taker too – think Yaya’s free-kicks when he went through that brilliant spell of scoring seemingly every other game. He clips the ball over the wall expertly, a real, clean finisher. Celina has done this repeatedly at youth level. The signs are encouraging, and with experience and a little luck there’s the potential for him to contribute to City’s fortunes in the coming years. For now a loan possibly awaits away from the club, but we can’t underestimate how important steps like today are. These youth players need that experience. That teaser, the carrot on the stick. It eases them in, shows them what it could be like for them in the future and it alleviates any initially understandable nerves that they may have. Thankfully, Celina is a confident player – evident in his two snapshots at goal despite being on the pitch for a handful of minutes – but others aren’t. That’s fine, either way. The important thing is pushing these players out of their comfort zone one by one. This is a step in the right direction. More of the same please, Manuel. Following on from Friday's piece, which featured Evans, Ntcham, Zuculini, Yeboah, Horsfield and Byrne, I’ve taken a closer look at the seven remaining loan players. Brandon Barker, Jason Denayer, Shay Facey, Angelino, Seko Fofana, Ian Lawlor and Enes Unal are all featured. As ever, it’s been a mixed bag, which is the norm for loans, regardless of the player’s ability. There’s seemingly an underlying train of thought from most that would lead you to believe that for a loan to have been successful, a player must have excelled during their temporary move. This, in general, isn’t necessarily fair or true. Successful loans, on the surface at least, are a rarity. Given the nature of the move, the chances of a player becoming one of the star players almost immediately is highly unlikely, even if they are exceptionally talented. That’s the case for players of any age, be it 18, 25 or 34. There are countless examples of players taking several months to adapt to a new team or environment. It took months before Yaya Toure found his feet in Mancini’s team initially for example. It’s only natural. Now bear in mind that these are young men, most hugely inexperienced, and it’s only reasonable to expect that things will be a little tricky. A youth loan isn’t about being the key man, creating goals or being a match-winner. That’s great, obviously, and it will happen sometimes, but it isn’t always about that. These moves are designed to test whether the player can adapt to the increased physicality and pressure that comes with professional football. If they’re a little quiet in terms of their influence, so be it, but the important thing is that they don’t look out of place. A club can tell if a young player can handle themselves amongst adults, but perhaps isn’t necessarily connecting with the team through various reasons, be it stylistically or tactically. The players are at Manchester City, so they’re certainly already very capable footballers, technically speaking. The performances will come later when the player has found their feet in the right setup around them. It’s all too easy to dismiss a low-key move as a failure, when it often isn’t the case at all. A young David Silva would most certainly struggle in League One, with his teammates likely on a different wavelength entirely, but the club will know and understand that. Elite prospects develop best alongside elite players with elite coaches, not out on loan. Loans are temporary, designed to test them in a certain way. These moves need to be viewed with those thoughts in mind. With that in mind, on to the players. A curious one, and a perfect example of how depressingly bleak the loan system can be. Exceptionally talented, and arguably the star of last season’s EDS team, it was perhaps surprising that Barker didn’t get the slightly more glamorous loan that his talents deserved – Byrne went to Cambuur, Ntcham joined Genoa, and Angelino left to the glitzy world of the MLS. Barker ended up in a relegation dogfight at Rotherham United. So be it. Even more surprising was the outcome. The winger was named in the starting XI immediately by Neil Redfearn and though Rotherham lost 5-2, he left the pitch as their MOTM having scored a stunning long range strike. Promising, and enough to whet the appetites of the Rotherham faithful. And then he disappeared. He was benched for four games in a row before City recalled him. Hugely baffling and most certainly undeserving, it showed just how unpredictable loans can be – ones to the Championship in particular. There was rumours that club politics came into it; their left midfielder met with Redfearn, bemoaned his lack of an appearance fee and just like that, he was back in the team. It wouldn’t be surprising, and it won’t be the last time a loan move will turn sour through no fault of a player’s own. Either it way, it happened. For now, Barker is back at City. Perhaps January will be kinder to the hugely talented winger and he can pick up a move where he can test himself in a better environment. He deserves it. It’s been a stop-start move so for the exceptionally talented defender. 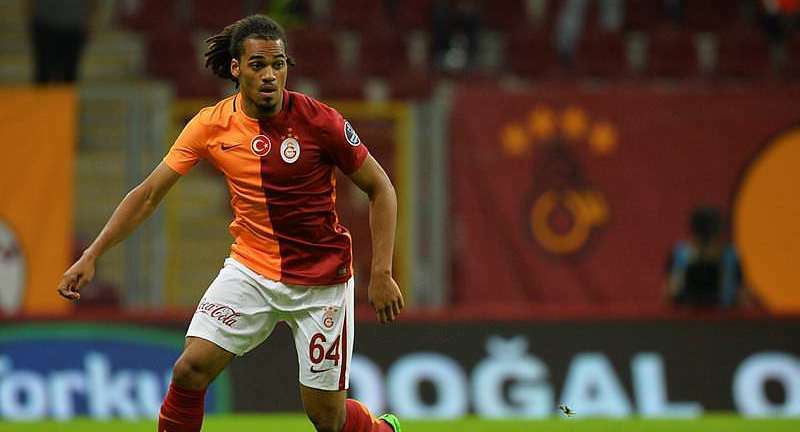 He joined Galatasaray at the start of the season and he was initially thrust into the team at centre-back, before moving over to right-back as their usual choice picked up an injury. He was good, performing with the same assured brilliance that those who’ve watched him closely had come to expect. Technically magnificent, intelligent and composed, he used all his skills to great effect as he slotted in naturally. He was by no means the star man, yet he was performing more than admirably in a position he had no prior experience in. It was encouraging, yet, typically, misfortune struck and his progress slowed. The curse of the Etihad’s injury list seemingly struck the young defender down from a distance and a spell on the sidelines followed. He’s had a couple of niggling setbacks and so far his appearances have been limited. 2016 should hopefully see him free of any knocks and he’s expected to return to full training any time now. There was calls from some quarters for City to recall him as Kompany broke down once again, though I’d be surprised if this an option. Only in exceptional circumstances can clubs recall players from a season long loan. It has to be written into a contract prior, and this is extremely rare. With a little luck, a strong run of games will perhaps be the platform he needs, and deserves, to convince those in charge that he can be a huge part of City’s squad rehabilitation over the summer, especially with the ageing Demichelis surely on his way. The eighteen-year-old Turkish striker has found life a little testing in Belgium. He moved to Genk after work permit problems meant he couldn’t kick-start his career over in Manchester. He’s been a regular in the squad, but mainly as an impact sub. There’s been twelve appearances in total, which is a decent amount, yet he’s only managed three starts so far. He has however scored a couple of times, despite mostly being introduced late on to freshen things up. It’s a little hard to gauge his performances, what with the paucity of information available online, but one thing that is for certain is that time is still on his side. He doesn’t turn nineteen until May and he’s an intelligent, considered player if his interviews are anything to go by. He’ll hope for more in the new year. Life has been good to the Irish u21 keeper so far this season. He spent the vast majority of last season out injured in what proved to be a hugely frustrating campaign. A small twist of fate saw him back in goal for the EDS as his main rival, the hugely talented Angus Gunn, picked up a small knock of his own. He impressed as City’s u21s beat Chelsea 2-0 in a televised game on Sky Sports, and that display, plus his already good reputation gained from representing Ireland’s u21s, saw him join Barnet a couple of weeks back as an emergency loan move. He’s done well so far, with the scorelines perhaps unfairly representative of his performances. He made a whole host of saves as Barnet claimed a 4-2 victory at Shrewsbury, and he pulled off a stunning save too as Barnet beat Newport 2-0. It hasn’t been all perfect, however. There’s been some slight hesitancy – the kind that plagues any youngster as he makes his professional league bow, but in general its been a promising move and his confidence has visibly grown with each game. He’s warmed himself to Barnet’s fans and its a move that will act as a nice starting point to his career. Fofana’s done well so far at Bastia. Whether it’ll be enough to further his career at City remains to be seen, but he’s clearly improved as a player. His time at Fulham last year was hit and miss, in and out of the team as Fulham fought relegation. He was likeable, all energy and full of boundless, powerful runs, but it often wasn’t enough to rely on as the Cottagers craved more experienced heads and consequently he spent a lot of time on the bench. Bastia seem to be caught up in a similar predicament, yet Fofana’s been a mainstay, encouragingly praised for his tactical awareness and calm displays at the heart of midfield. He’s always had raw talent, plenty of it in fact. Yet it was his composure that often let him down, but the signs are good. I’ve caught a couple of games and he’s playing with considerably more intelligence, positioning himself well, sitting far deeper than he ever did for City’s EDS and Fulham. A little more Yaya-like, if you like, dictating play from deep. He’s becoming a key figure at Bastia and that will surely only help his development as he gains a sense of seniority and belief in his own abilities. With 17 starts already, and still only aged twenty, he’ll surely continue to improve. He’ll have to reach a high level if he’s to succeed at City, but there’s time yet. 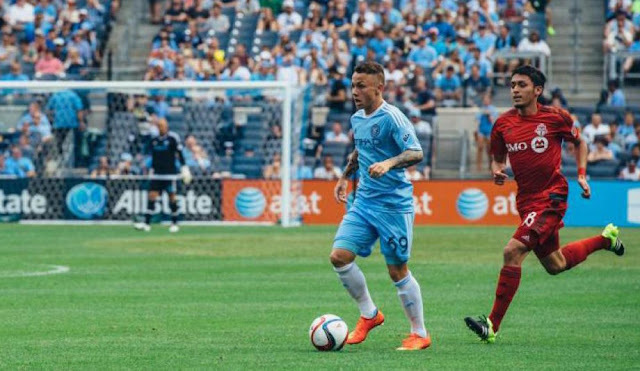 Angelino and Shay Facey returned to City from New York in November as their loan spells ended. It was a curious move for Angelino. It started well, yet it ended on a relatively lower note. His initial energy gave way to some uncharacteristically conservative displays, with his all-action approach seemingly fading a little as the weeks passed. Given his age, it was no surprise, and it could have been entirely circumstantial too. The MLS is a tough league, in the sense that it’s a crazy one. There’s very little organisation over there and games often resembled a basketball match. Free for alls, with little cohesion or sense. He’s surely learned something, though it’s unlikely to be defensively – those around him offered little in that field and he looked far too naive around his own area at times. It’s a shame as it is the one side of his game that he needs to work on. He’s clearly a very good footballer – his four assists being clear proof. He shuttled forward well, adding a huge amount of skill and intelligence to New York’s attacks, yet we knew that already. The next move will be crucial. He’ll be physically stronger than he was, at very least, but you can’t help but think what he would have learned playing in a settled, organised back four for a few months. A lesson learned perhaps. As it stands Angelino’s back training with City’s first team as he’s currently ineligible to play until January due to the stipulations of his loan. I’d suspect Angelino will move again, and rightly so. Facey already has. He confirmed a loan move to Rotherham until the end of season on Saturday morning and he was immediately thrust into the starting eleven at right-back. Though Rotherham lost 2-1, going down to a last minute own goal, he drew praise from Neil Redfearn for his energy, reading of the game and tenacity. It’s an interesting move, especially considering how Barker’s loan panned out there, but I guess there’s enough trust from City to allow Neil Redfearn a second player. How he develops in the Championship will be fascinating. He was functional at NYCFC, usually played at centre-back, where he went through a similar run of form to Angelino. He started well, then struggled a little as his inexperience showed, clearly in dire need of a composed, wiser head alongside him. Facey was good when played at right-back for the EDS, and it was heartening to see him start there for Rotherham. He seems to have all the attributes to excel out wide. Fast, tenacious and good on the ball, perhaps a little Trippier-esque. The Championship is a tough league, and Rotherham are struggling too, so it’ll be a baptism of fire so to speak, but his debut showed some promising signs and he’ll learn a lot. I had initially suspected Vieira may have decided to bring him back to NYCFC but for now that won’t be the case. He’s still only twenty and he signed a two-year contract when he returned to City, so the door clearly isn’t closed on him yet at the Etihad. Time will tell. Elsewhere, I wouldn’t be surprised if Vieira takes another one or two with him – there’s rumours that Pablo Maffeo has been lined up to make the move. That’d be a tad disappointing from a personal perspective. I don’t mind then MLS, but I think he deserves better, even a shot in the first team given his excellent EDS form, or perhaps a move to a strong European league. Hopefully under close watch from City the move could run a lot smoother. If that comes to fruition, don’t be surprised to see another of his EDS teammates join him come the start of the season. NYCFC, though a team in its own right, will clearly be used as a sort of finishing school for City. The ties with Girona in Spain are intriguing too, especially given Pere Guardiola’s involvement at the club. Pep’s brother, of course. If injuries subside, expect loan moves for a few of the EDS’s stalwarts. Ambrose, Aleix Garcia and Kean Bryan are all out injured, so they won’t be going anywhere, and that may also put on hold any temporary moves for the likes of Celina and Glendon, even Bytiqi who has now recovered from his injury problems. There simply isn’t the numbers in reserve otherwise. Still, do expect more to move on over the next couple of months. Barker will likely move out again. Roberts, too, has spent far too much time watching from the sidelines and his game has stagnated recently which is understandable given his lack of competitive football. The experience is necessary, and they will surely get it in due course. If, and when, it happens, there will be reports on here following their progress.